Christopher Paul Curtis is the award-winning author of The Watsons Go to Birmingham—1963, Bud Not Buddy, Mr. Chickee's Funny Money, Mr. Chickee’s Messy Mission, and Bucking the Sarge. His second novel, Bud, Not Buddy, is the first book ever to receive both the Newbery Medal and the Coretta Scott King Author Award. Check out his website here. The Watsons Go to Birmingham was the debut novel that put Curtis on the map, and he has continued to satisfy readers with his poignant characters and heart-warming stories. In September 2014, Curtis released the companion novel to the Newbery honor book Elijah of Buxton. We return to Buxton with the dual stories of Benji Alston and Red Stockard in Ontario, Canada, an actual town established by slaves leaving America in 1849 as part of the underground railroad. Though their lives are intertwined, they don't actually share a story until later in the novel. It's 1901, and Benji is pretending to be a Union soldier. Red is spending his Saturdays going into town with his grandmother to get groceries in the neighboring town of Chatham. The boys' lives are similar in their apparent freedoms but not in their physicality. Benji is an African-Canadian while Red is a white immigrant's son. 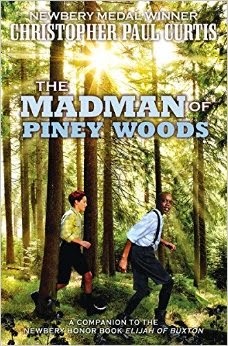 While the woods would normally represent adventure, both Benji and Red have heard the stories of the Madman of Piney Woods. Little do they know that this mysterious man holds the key to their connect their fates. Curtis writes with the childlike innocence of the thirteen-year-olds he presents in a novel that has everything from action and adventure to heartbreak and sorrow. While some readers may become frustrated that Benji and Red don't meet each other until about halfway through, the build up to their encounter is worth the wait. The characterization of the boys is realistic and believable, and Curtis once again (plus readers of the first book will catch up with Elijah's story) makes readers fall in love with his detailed descriptions of a town and place that seems fictional but carries historical significance. The short chapters will hold the attention of young readers, and the excitement and anxiety surrounding the mystery of the woods leads up to the very end. Hopefully readers will seek more knowledge surrounding the small town of Buxton as it is a story of settlement not many are aware of. Though fiction, Curtis paints a picture of boyhood so successfully, the novel reads more like a newspaper feature.